After the Rangers swept the Thrashers in the first round of the playoffs last season, Atlanta coach Bob Hartley had a short leash to start this season, and he was fired after an 0-6 start. The Thrashers are 14-7-1 under general manager and interim coach Don Waddell, including two wins over the Rangers. Never underestimate the momentum of three big losses. The New York Rangers lost 4-2 to the Atlanta Thrashers last night for the third loss in a row. A potential loss tomorrow against the red-hot NJ Devils, having won every contest against them this season, could create an unstoppable downward spiral. Hate to say it again, Coach Renney is in trouble. Henrik Lundqvist sat out last night, replaced by Stephen Valiquette - who I still feel played an adequate game, though without any team support he was overwhelmed by on onslaught of offensive Atlanta thrashing. If Henrik sits out against tomorrow -- all is lost -- because this means Tom Renney has lost confidence in his goalie. It doesn't matter if Henrik has lost his confidence -- a good coach instills confidence in his players. NYR General Manager Glen Sather fully expects Tom Renney to exploit his new purchases this season -- the speed demon Scott Gomez, the clutch-man Chris Drury -- and the All-Stars that make this team such an attractive franchise on paper - Jaromir Jagr, Brendan Shanahan, Henrik Lundqvist, Martin Straka, etc..plus one of People Magazine's sexiest "we love to hate"....of course, he needs no introduction. The philosophy that these players cannot connect is ludicrous and insulting. Coaching makes the match. Dubie on the first line with Straka and Jagr? Heaven's to Betsy. I continue to be a huge supporter of Dan Girardi and Marc Staal - and even with Marek Malik sitting out last night - it is apparent we do not have the blueline this team needs. Duh. I am back on my pre-season vow to trade for that much needed "D-Man." Scotty Hockey does a convincing "what if" Schneider from the Anaheim Ducks wants to be a Ranger (I agree, Scotty, but he completely injury prone), though, with Sather & gang vs. The Salary Cap precedent - there is minimal room to consider it. The losses hurt less the more pathetic the Rangers get, so I'll leave with "there are plenty more games in the season", but a shake-up is required to find or motivate that All-Star chemistry we all bought into. Someone can do it. A good coach can do it. 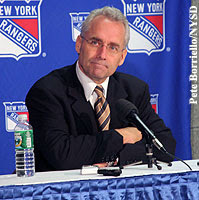 My fellow BlueBlogger "coach-disappointed" Ranger Pundit feels Tom 'Coach Clueless' Renney is not up for the job and I may soon be jumping on that bandwagon. Let's see after tomorrow's meeting. thr-Its getting close for a change. Unfortunately for us diehards its getting very close. 1) Barring injury there is ZERO chance that Lundqvist sits tomorrow! 2) That said we agree with your analysis that Renney will not be given a great deal of latitude to right the ship. The Jim Schoenfeld era may be soon upon you! scotty..awesome uTube...thanks. bring him on. You'd never see Renney let anything get in the way of his recently pressed Armani. Agreed on Renney, though I think he isn't clueless, I think with the stars he may be over his head. The Rangers need a motivator and a Keenan-esque performance by Renney to get this group going.